Puerto Rico is losing a doctor a day. Justin Maldonado learned that fact in the most tragic way possible. His uncle had a stroke in the summer of 2014. The family rushed him to a local hospital in Coamo. The emergency room doctors recommended that his uncle be taken immediately to a neurologist. Then the Maldonado family was told only two neurologists were on duty for an entire island of 3.5 million people. It was a holiday weekend. His uncle died several days later. "Don't get hurt in Puerto Rico, especially on a holiday or a Sunday," says Maldonado. Occasionally, he drives by the hospital where his uncle died. There are always people waiting. The family has taken to calling the lines "the walking dead." In 2014, 364 doctors left the island never to return, the Puerto Rican Surgeons and Physicians Association says. Last year, 500 doctors packed up. Most moved for more lucrative positions in the mainland U.S. The island is in a financial crisis of its own -- it doesn't have enough money to pay back over $70 billion in debt. On Wednesday, the House Committee on Natural Resources is holding another hearing to determine what to do. There's been a lot of attention on whether to allow Puerto Rico to declare bankruptcy (or something like it). But the deeper problem is that the island has been in an economic crisis for a decade. That's why doctors -- and other professionals -- are fleeing. 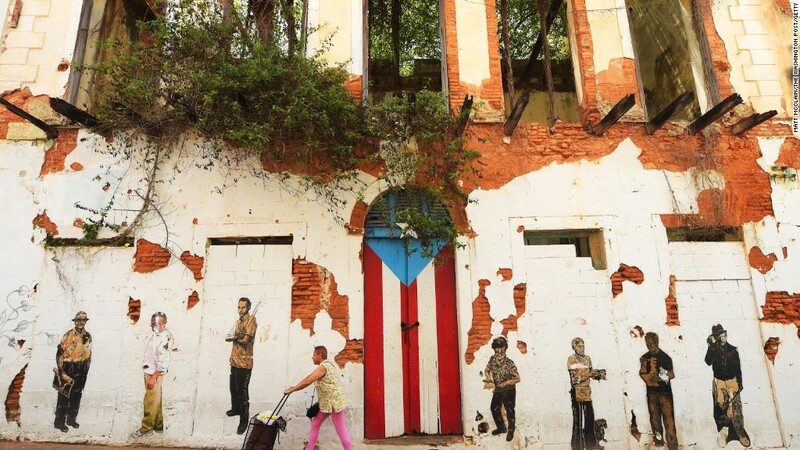 Puerto Rico has lost over 10% of its population in the past decade. Jobs just aren't there and home values are plummeting. On top of that, Medicare reimburses doctors far less in Puerto Rico than other states. "I have a hard time recruiting. We can't compete with institutions in the U.S.," says Dr. Fernando Luis Joglar. He's a vascular surgeon and president of the American College of Surgeons Puerto Rico Chapter. He gets offers all the time from hospitals in the mainland United States. Many come via letter or postcard. His wife leaves them out on the kitchen table for him to see when he arrives home. She doesn't even have to say it out loud, why are they still in Puerto Rico? For Dr. Joglar, it's because his family is there and he worries what will happen if he leaves. His specialty is a lot like neurology. There are only a handful of vascular surgeons left who operate on veins and arteries. If he goes, he believes corpses will pile up. "The recession is getting worse. It's effecting private hospitals. They're closing," says Dr. Joglar. Congress has promised to take some sort of action to aid the island in its time of crisis, likely before a huge debt payment is due to creditors in July. There's a push to give Puerto Rico more federal Medicare and Medicaid funding in the final bill. But the initial "discussion draft" legislation didn't include any additional health care money. Governor Alejandro García Padilla has gone as far as to declare a "humanitarian crisis" on the island. His office notes that Puerto Rico "receives less than half the federal healthcare funding of any of the 50 states." The Zika virus outbreak has only stressed the island's medical system further. "If they don't stop the bleeding now, this is going to get super ugly by the end of the year," says Maldonado. He's trying to convince his 80-year-old mother to move back to New York City with him.